Phillip Rucks, founder of Phillip Rucks Citrus Nursery, is a native of Polk County, Florida and a graduate of Frostproof High School. Phillip graduated from Florida Southern College in Lakeland, Florida and has over twenty-five years of experience managing and developing three modern, high-tech citrus nurseries including operations for Becker Groves of Ft. Pierce, Florida and Jack M. Berry, Inc of LaBelle, Florida. 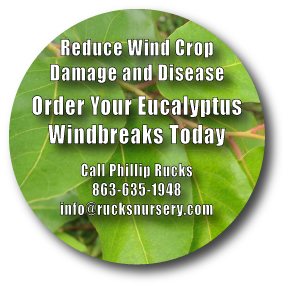 He has owned and operated Phillip Rucks Citrus Nursery, Inc. in Frostproof, Florida for the last fourteen years. Phillip Rucks innovative efforts in the area of improved nursery practices and standards have become a model for the citrus industry. Phillip has served as President of the Florida Nursery Growers and Landscape Association (FNGLA) Citrus Nursery Division and served as President of the Florida Citrus Nurserymen’s Association (FNCA). During his tenure he successfully led a campaign that united the Florida Citrus Nursery Industry to implement mandatory budwood programs to protect the industry form graft-transmissible diseases and prohibit the movement of trees containing severe Tristeza virus strains. Phillip Rucks maintains a high level of personal commitment and a relentless focus on quality and integrity that serve as the core values for one the largest and most efficient citrus nurseries in the world. Over the last twenty years he directed his efforts at developing a self-sufficient, self-contained nursery by establishing plant supportive material including registered high yielding seed and budwood blocks. A screened insect-proof mother budwood house constructed in 2002 supports a disease-free quality citrus tree. To insure future protection a state-of-the-art laboratory houses tissue cultures for the most popular citrus, peach and eucalyptus rootstocks.